Perhaps we are seeing early signs that the market is beginning to balance, as Steamboat Spring’s inventory rose for the second month in a row. At the end of July, there were 476 properties for sale, up from our low of 386 in November 2017. Looking back, we are a long way from 2010 when there was an inventory glut of 1,300 properties for sale. Anything less than six months of inventory represents a seller’s market, meaning home prices will rise. While most of the country has had under six months of inventory for much of the last four years, Steamboat is now hovering above the six month mark. In inventory starved cities, such as Denver, the average sale to list price is over 100%; in Steamboat, we are at 97%, indicating that we're moving towards a neutral market. When inventory isn't overly abundant, many people consider building as a viable alternative. In one short year, the Sunlight neighborhood, on the west side of town, has sold 50 of the 53 available lots. Within the next month, construction will be underway on over half of those lots. The developers just released another 24 lots to respond to demand. While construction costs continue to rise as the impact of tari s on lumber, steel and aluminum gets passed down to homebuilders, many buyers are still opting to build. It will be interesting to see how the market changes over the next few months. Typically, inventory dwindles throughout the year, as we don't see an in ux in supply until the spring, but perhaps buyer demand is slowing enough to keep inventory steady. 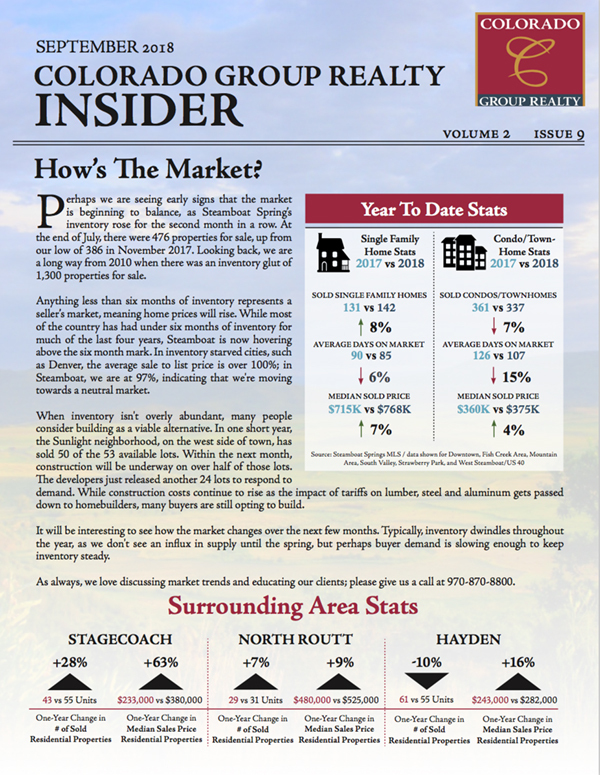 As always, we love discussing market trends and educating our clients; please give us a call at (970) 846-8811.